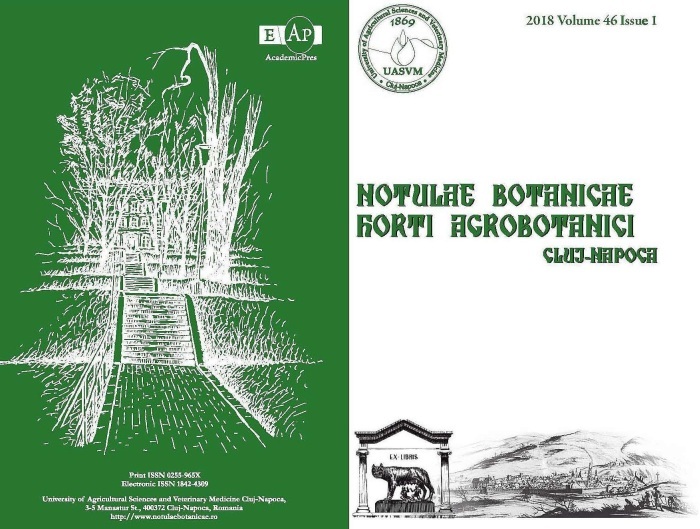 Notulae Botanicae Horti Agrobotanici Cluj-Napoca (http://www.notulaebotanicae.ro/) is a peer – reviewed biannual journal aimed at disseminating significant research and original papers, critical reviews and short reviews on plant breeding, genetics, diversity and development of new methodologies that can be of interest to a wide audience of plant scientists in all areas of plant biology, agriculture, horticulture, and forestry. The journal encourages authors to frame their research questions and discuss their results in terms of the major questions of plant biology and agriculture, thereby maximizing the impact, spreading and value of their research. The papers must be of potential interest to a significant number of scientists and, if specific to a local situation, must be relevant to a wide body of knowledge in biology and agronomy. Articles should make a significant contribution to the advancement of knowledge or toward a better understanding of existing biological and agricultural concepts. An international Editorial Board advises the journal. The total content of the journal may be used for educational, non-profit purposes without regard to copyright. The distribution of the material is encouraged with the condition that the authors and the source (Notulae Botanicae Horti Agrobotanici Cluj-Napoca or JCR abbrev. title Not Bot Horti Agrobo) are mentioned. Notulae Scientia Biologicae (http://notulaebiologicae.ro/) is a quarterly peer-reviewed journal aimed at disseminating significant research and original papers, critical reviews and short reviews on life sciences and medicine, development of new methodologies that can be of interest to a wide audience of scientists in all areas of biology sciences. The journal encourages authors to frame their research questions and discuss their results in terms of the major questions of biology, agriculture, horticulture, forestry, biotechnology and medicine, thereby maximizing the impact, spreading and value of their research. The papers must be of potential interest to a significant number of scientists and, if specific to a local situation, must be relevant to a wide body of knowledge in life and medical sciences. Articles should make a significant contribution to the advancement of knowledge or toward a better understanding of existing biological, agricultural and medical concepts. An international Editorial Board advises the journal. The total content of the journal may be used for educational, non-profit purposes without regard to copyright. The distribution of the material is encouraged with the condition that the authors and the source (Notulae Scientia Biologicae or abbreviated title Not Sci Biol) are mentioned.